Another week, another group of highly touted high school seniors have been added to Charlie Strong’s never-ending Class of 2016. In quick succession, the Longhorns added three former Baylor commits. 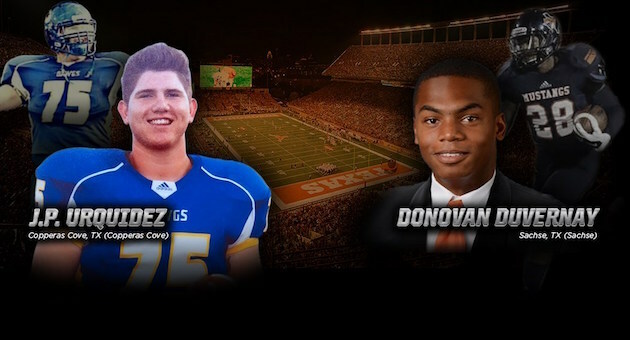 Saturday was big: 300-pound Copperas Cove offensive tackle JP Urquidez committed on Saturday afternoon, with Sachse, Texas wide receiver Donovan Duvernay following that evening. On Tuesday, it was erroneously reported that Silsbee, Texas 325-pound offensive guard Patrick Hudson had chosen the Longhorns over Oklahoma. No matter. This morning, Hudson confirmed what many (re: Malik Jefferson) already knew to be true. The No. 2 OG in the nation was coming to Texas, joining an already-stacked freshman core of offensive lineman, including Zach Shackleford, Jean Delance, and Denzel Okafor. This was after sought-after WR Devin Duvernay, Donovan’s twin brother, wriggled free from Baylor in the wake of the massive sexual assault scandal in Waco, after his NLI was deemed invalid and signed with Texas early last week. Obviously this is wonderful for Texas and its legion of fans, growing impatient after a dearth of talent and wins the last couple years. The rallying cry on social media, started by an ever-popular fake Charlie Strong Twitter account, has become “Errbody!” beginning with the historic national signing day for the real Strong in February, and continuing into this unexpected phase two of 2016 recruiting. With these final three signings, Texas has everybody it could possibly need, and unstoppable momentum for the future. It also has no excuses going forward, as fans expect the victories in February and now June to act as mere appetizers to the main course.